When I started on this journey, I honestly had no idea where it would take me. I had a vision, if that, because I hadn't completely fleshed it out. I wanted to continue styling spaces but I didn't want to be a visual merchandiser anymore. I wanted something more meaningful and purpuseful; not that I was trying to save the world, but I wanted to really feel connected to what I was doing. I contemplated going back to complete my architecture degree... but I knew in my heart of hearts, I still didn't want to be an architect; at least not in the traditional sense of what I knew an architect to be. So then I considered interior design but I honestly had no real grasp of what "interior design" was because for years I'd seen the title used in so many different ways. What exactly did an interior designer do? And how? I had no idea how I fit into all of this because I didn't really fit into any of it. I just knew whatever it is I was going to do, I wasn't going to get there by working for someone else and trying to climb up someone else's ladder. During this time of self evaluation, I had become a new mom, a new wife, and a new student. It was an exciting time but also a very overwhelming time; so I needed a shortcut. I started looking at what other designers and entrepreneurs were doing and how there were doing it. Instead of getting inspired by people who I should be considering my peers, I was getting a bad case of anxiety and envy. I started taking on freelance projects, which felt good for a while, like I was on the right track design wise; but it still didn't feel authentic and I still felt anxious and uneasy. After months of this, I felt burnt out -- physically and emotionally -- and hadn't made any real progress... at least not for me. Ready for a plot twist? After nearly a year of being away on active duty, my husband came home & I now had to prepare for a cross country from New York to Washington. Saying, "it was the best of times; it was the worst of times," would be putting it mildly! After a VERY quick move, I was now in a new city, my newborn was now a very active toddler, my husband was getting ready to start a new job... and I was honestly just trying to keep it all together. At this time, I had to make the very difficult choice to take a step back from designing to really assess what I was doing, why I was doing it, and how to get it done. During my hiatus, I realized the way I was doing things wasn't for me because it wasn't me. 💡 I was trying to fit into everyone else's mold -- a mold that may very well had worked for others but certainly wasn't working for me. 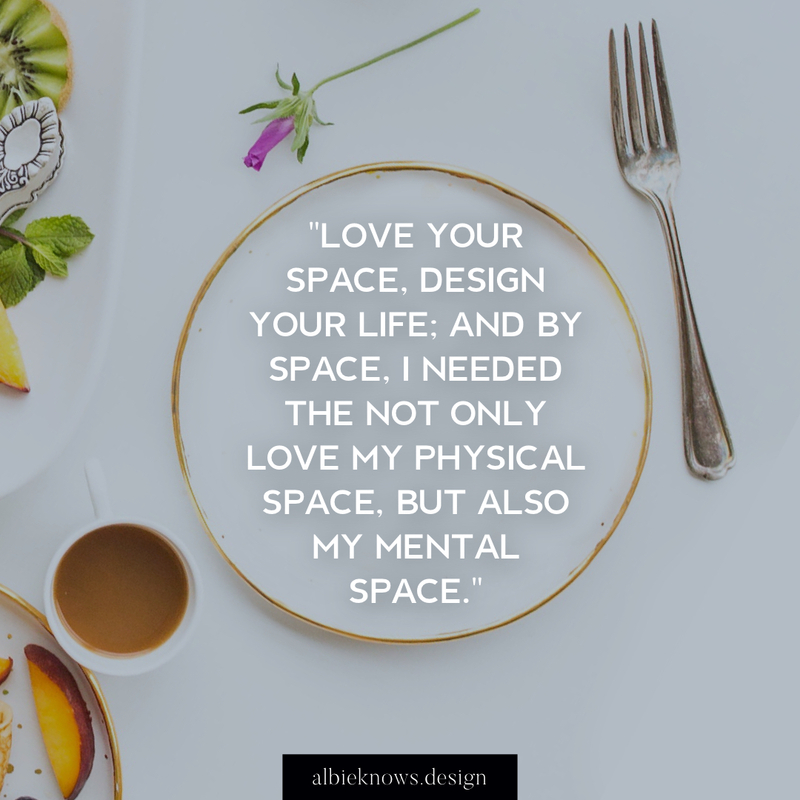 I had to follow my own tag line -- love your space, design your life; and by space, I needed to not only love my physical space, but also my mental space. I was doing too much but not doing any of it well; not because I couldn't but because it wasn't truly me. Once I began to be more honest with myself, my vision started to become clearer and more fleshed out. I resumed designing and taking on projects, but in a way that made more sense for me and for my lifestyle. This new "honesty" began to reflect in my projects and resonated with clients as well. I began to force myself to dig deeper and really take stock of how, in a perfect world, I wanted my business to really reflect -- who I wanted to work with, the type of designs I wanted to take on, ad hoc projects I wanted to establish, and the legacy of my brand. Admitting to myself that I don't want to do every type of design project for everyone was HARD! Admitting that I feel at my fullest when I'm working with creative entrepreneurs who just want to find a little bit of peace and balance amid all the balls they have in the air... realizing that I can help them, and teach them how to do that... it all felt very selfish and naive. But at the same time, it felt really freeing, like a weight was lifted off my shoulders. And this was only one of the many come to Jesus moments I had to grapple with. After one whirlwind of a year, I am here rebranding, and essentially relaunching my business; oh yeah, and growing my very first subscription box. CRAZY! A year ago today if someone told me that I, as a novice designer, would have launched a home decor box and design intensive... I would've looked at them like they have 6 heads & all 6 proposed marriage... that's how absurd it all would've seemed to me. But guess what... I LOVE IT ALL! I'm excited for the journey ahead because I'm defining my path in a way that feels good versus a way that simply looks good -- the irony. I can't lie -- it's been super hard balancing my 8 million ideas, my responsibilities as a mom & wife, going back to school... ALL on top of the business. I got a little fatigued just typing that all out. Sheesh! But I can see, even though I've been probably the most exhausted I've ever been in life, I am also probably the most inspired I've been in a very very long time! Thank you to all of you who have been along on this ride with me and I can't wait to share this adulting adventure with y'all. I Am So Proud of my New Design Intensive!